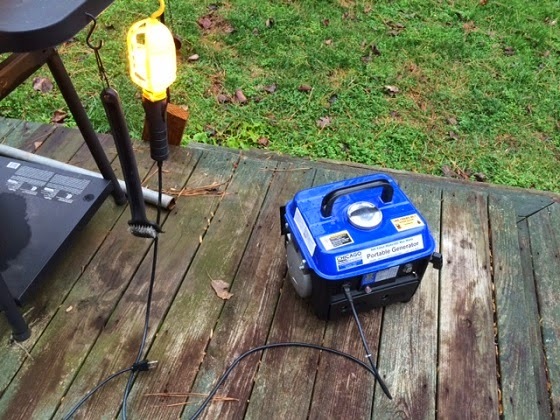 This is a tiny 800 watt generator I picked up at Harbor Freight a year or more ago. Had a 20 percent coupon, and my cost out the door was under $80. Bought it on a whim, tossed it up on a shelf in the basement, and there it sat since purchase. Until this week. Pulled it out Christmas Eve. Popped in a U.S. made spark plug, and fired it up. It buzzes, it chugs, it hums right along. And it puts out AC power. Not exactly clean or steady, but close enough. There are literally dozens of reviews online for this little machine, so I won't delve into a full review. My intended primary use is to will be to recharge batteries used to power a 300 watt inverter. Three hundred watts is sufficient to keep Internet and VoiP phone up and running during winter storm power outages, it can also run an LCD TV and recharge a laptop. Direct current from 12 volt batteries can also be used directly to power my Ham radios. I will say, I find this Harbor Freight unit quieter than expected. It's powered by a two-cycle engine, but running with a half-load, the engine's hum was barely audible inside my house (with windows and doors closed, of course). The unit was only about 25 to 30 feet outside the back door. No, it's not a "quiet" generator, but it's seems a whole lot quieter than the aging Coleman Powermate that's sitting in my garage. I've undertaken several other power back-up projects this week. I mentioned the inverter; actually there's two, both rated at 300 watts and produce a true sine wave feed. And I've added a power transfer switch to the downstairs furnace. Bought it more than seven years ago, but I was diagnosed with cancer not long afterward, and never got around to installing it until today. A couple other rudimentary enhancements are also in the works. Planning to share more about those in the coming week or two.